A bit of snow finally arrived this winter for the Ozarks. The thermometer sat about thirty-four degrees as the snow fell, perfect for cement snow. Snow is interesting stuff. It forms below freezing and drifts down. The type of snow depends on the temperature. Up north snow fell with temperatures in the teens. Tiny bits of white from thin clouds seemed to never end, piling up for inches. The bits were like grains of sugar and poured from the hand like it too. They squealed underfoot as we walked across them. 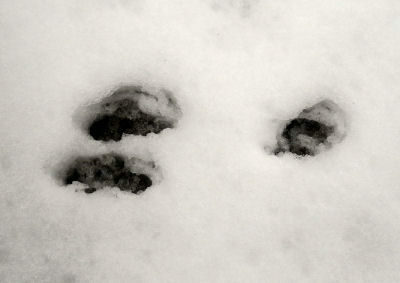 Rabbit tracks are among the easiest to recognize as the two front feet land together and the two back feet separately giving a triangle pattern. In cement snow the feet punch straight down to the ground. When the temperatures were in the twenties, the snow often fell as flakes. These are the patterns for children’s paper cut outs. The clouds were heavier, but still thin enough to make out where the sun was. This snow crunched underfoot. 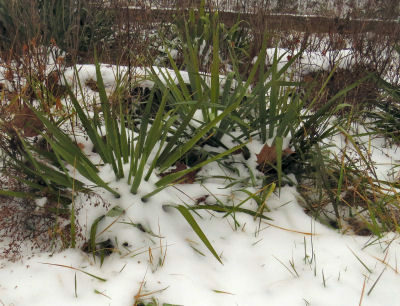 Yucca leaves roll their edges in for cold weather. Cement snow isn’t cold enough so the leaves poke out through it. The snow in the Ozarks is different. Temperatures are often near freezing as the snow falls. The flakes can be clumps that splat on the ground. Stepping on this snow squashes it down, making it appear wet. It is wet. This is cement snow. Water is heavy, eight pounds to the gallon. Cement snow is heavy too, close to that eight pounds a gallon. 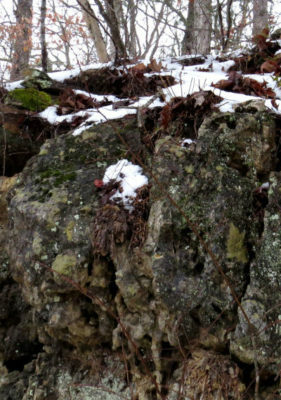 Mosses, ferns and other plants like columbine depend on snow to add moisture to their perches on the rocks. This exposed piece of bluff rock is full of cracks and crevices. Cold snows are easy to shovel. Lesser depths sweep easily off walkways with brisk swooshes of the broom. Deeper amounts push easily with a snow shovel or are light to toss out of the pathway. Cement snow sticks to the shovel. It mounds up quickly sticking itself into those mounds. Every scoop must be pounded on the ground to remove the lumps. Some need manual shoving. It is exhausting work. 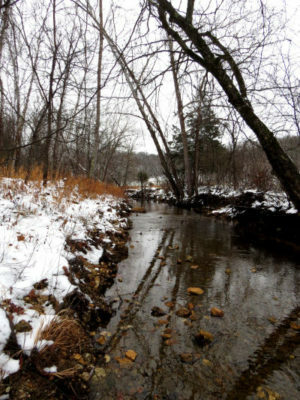 Cement snow means water for this Ozark creek. It is up making large languid pools, but the residents are tucked into deep places trying to keep a bit warm. Only a few inches of this potential heart attack trigger fell. My regular pathways are mostly melted into muddy trails. The roads have long stretches bare of snow. The biggest disappointment with cement snow is how it looks. It lacks the charm of colder snows. The advantage with this snow is how fast it melts once the sun reappears. This entry was posted in Ozark Hills and tagged temperatures affect snow, winter in Ozarks on January 16, 2019 by [email protected].